Waterproofed coat/cape for wearing over rucksack. Three buttons and buttonholes down front. Two buttons and one buttonhole on collar. One button pocket on left hand side. One button below pocket. Two buttons on right hand side. Canvas tapes and loops inside back of neck. 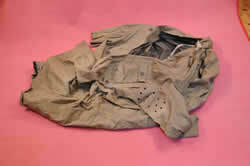 Twelve air holes under each sleeve. From neck 126(l) x 92 ( w)cms. Sleeve 58(l) cms. "MD 1940 " written in ink inside left front. This fairly unused item of clothing was given to Mick Tighe by Mary Connor, Roy Bridge, widow of Ephraim Connor, one time proprietor of Glenspean Lodge Hotel and a Homeopath. Ephraim had a military background and was a shooter/marksman and we suspect this coat/cape came from one or the other of these camps.It would seem to be around the 1940's era and of good quality originally. Given to Mick Tighe by Mary Connor, Roy Bridge - now deceased.